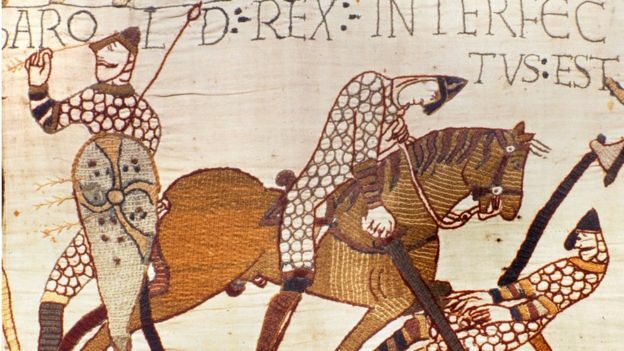 King Harold (left) was killed by an arrow at Hastings, as shown in the Bayeux Tapestry. The English leaders then turned to the 14-year-old Edgar. The notion that Harold died by an arrow to the eye is a popular belief today, but this historical legend is the subject to much scholarly debate. A Norman account of the battle, Carmen de Hastingae Proelio ("Song of the Battle of Hastings"), said to have been written shortly after the battle by Guy, Bishop of Amiens, says that Harold was killed by four knights, probably including Duke William, and his body brutally dismembered. Twelfth-century Anglo-Norman histories, such as William of Malmesbury's Gesta Regum Anglorum and Henry of Huntingdon's Historia Anglorum recount that Harold died by an arrow wound to his head. An earlier source, Amatus of Montecassino's L'Ystoire de li Normant ("History of the Normans"), written only twenty years after the battle of Hastings, contains a report of Harold being shot in the eye with an arrow, but this is possibly an early fourteenth-century addition. Later accounts reflect one or both of these two versions. A figure in the panel of the Bayeux Tapestry with the inscription "Harold Rex Interfectus Est" (Harold the King is killed) is depicted gripping an arrow that has struck his eye, but some historians have questioned whether this man is intended to be Harold, or if Harold is intended as the next figure lying to the right almost supine, being mutilated beneath a horse's hooves. Etchings made of the Tapestry in the 1730s show the standing figure with differing objects. Benoît's 1729 sketch shows only a dotted line indicating stitch marks without any indication of fletching (all other arrows in the Tapestry are fletched). Bernard de Montfaucon's 1730 engraving has a solid line resembling a spear being held overhand matching the manner of the figure to the left. Stothard's 1819 water-colour drawing has, for the first time, a fletched arrow in the figure's eye. Although not apparent in the earlier depictions, the Tapestry today has stitch marks indicating the fallen figure once had an arrow in its eye. It has been proposed that the second figure once had an arrow added by over-enthusiastic nineteenth-century restorers that was later unstitched. Many believe that as the name "Harold" is above the figure with an arrow in his eye, though this has been disputed by examining other examples from the Tapestry where the visual center of a scene, not the location of the inscription, identifies named figures. Further evidence is that an arrow volley would be fired before the Norman cavalry charge. A further suggestion is that both accounts are accurate, and that Harold suffered first the eye wound, then the mutilation, and the Tapestry is depicting both in sequence. Thank you very much indeed, now should I point this out to the BBC and see if they print a correction? The tapestry has only shown an arrow in the eye of that figure since the 19th century, following a 'restoration'. Engravings and other illustrations of the tapestry dating to the 18th century show it as a spear being held by the alleged "Harold" figure and it is still possible to see stitch holes in the tapestry on the other side of the figures helmet which show where the rest of the spear-shaft was.